Home Innovation Should business be allowed to patent mathematics? 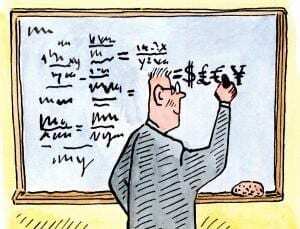 Should business be allowed to patent mathematics? AT SOME point in their career every mathematician comes up against the question, is mathematics invented or discovered? The query makes some cranky. The answer doesn’t directly affect their work, after all, and the discussion often leads nowhere useful. Spending time debating the ultimate nature of mathematics takes away from actually doing it. Some scholars take issue with the terms themselves. In his 2008 essay Mathematical Platonism and Its Opposites, Harvard University mathematician Barry Mazur called discovery and invention “those two too-brittle words”. One might be tempted to defuse the question altogether with a merger: perhaps maths involves inventing new relationships between things we have discovered. It’s a metaphysical query, a nerdy way to ask whether or not some pre-existing truths underlie our existence. Here we bump up against theology. If mathematical ideas are discovered – the Platonist position – then a proof is a real-world encounter with an immortal truth. But then where, exactly, is this ethereal pool of truths? Did prime numbers exist before the big bang? If, on the other hand, mathematics is invented, then proofs spring from human intelligence a bit like art or law. But then why do mathematicians across time and space always agree on what’s right and wrong? The question about invention versus discovery flares up every few years, often in a different guise. The latest incarnation concerns something very down to earth: money. In this case, the discovery versus invention question has profound consequences. In fact, there may be no mathematical question with higher stakes. That’s because mathematics powers the algorithms that drive computer software, and software is big business, worth over $300 billion a year to the global economy. One of the most hotly contested issues in software is whether it should be patentable. At present not all of it can be, because of its dependence on mathematics. Patents are granted for inventions, and most mathematical formulas are deemed to be abstract ideas, not inventions, although the rules vary from country to country; some grant software patents, some don’t. Where patents are granted, they are tantamount to big money. Writing in the April 2013 issue of Notices of the American Mathematical Society, David Edwards from the University of Georgia in Athens points out that the debate over patents boils down to the difference between discovery and invention. He argues that because abstract mathematical ideas are regarded as “discoveries”, the system is fundamentally Platonic – and broken. “There is no economic basis for the distinction between discovery and invention,” he told me. “Economically speaking, the difference between discovery and invention should be done away with.” He argues patents should be granted for every new formula and algorithm, including those that power computer software. Such a change would jump-start innovation. “If math were patentable, then you could have independent groups of mathematicians form a group or small company and support themselves that way,” he says. His position is extreme, but proponents of software patentability similarly argue that the system fuels growth and rewards people for their work. Critics, notably the nonprofit Electronic Frontier Foundation (EFF) in San Francisco, say the current patent system actually stymies innovation, because getting a patent requires years and tens of thousands of dollars. Another criticism is that hazy wording in software patent laws has given rise to “patent trolls”, predatory companies that purchase old, cheap patents simply to use them to sue other companies for infringement. Trolling cost US companies $29 billion in 2011, according to a report from the Boston University School of Law. The Chicago-based company Soverain Software, for example, has been accused of being a patent troll. It has racked up tens of millions of dollars suing companies including Amazon and Gap over patents for basic online shopping software. The online computer retailer Newegg, sued by Soverain for $2.5 million, fought back – and in January a US District Court in East Texas ruled against Soverain. Even if trolls get banished, weak patents exist.